Is your wash bay waste water becoming expensive? Meeting wastewater regulations and lowering waste disposal costs requires a detailed understanding of how conventional cleaning and degreasing chemicals work and the way in which they affect oil water separators. Aside from the cost of oil content which is emulsified in wastewater, it is also important to consider the impacts of conventional degreasing chemicals themselves on the environment and worker safety. Triple7 Quick-Break Degreasers provide a very short lived emulsion to lift and remove grease and oil from all types of surfaces. The emulsion is highly unstable and breaks right at the cleaning surface, which allows oils and greases to rise to the surface immediately, and removes the need for retention time in oil water separators! Now THAT is quick break! 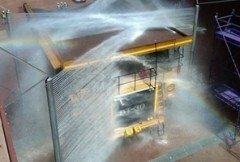 Reduces waste water cost, improves waste water system performance, and safer for the environment and your workers. 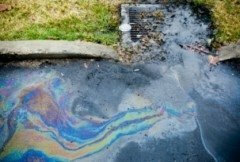 For industrial cleaning and degreasing operations, cost effective wastewater management relies on the efficient removal of oils and other hydrocarbons from wastewater prior to its release. This is normally achieved through gravity type oil water separators. A quick break degreaser is a specially designed surfactant which lifts oil, grease and other hydrocarbon soils from the cleaning surface without forming a permanent emulsion. 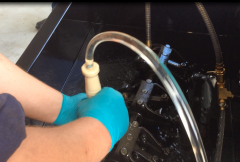 Once the oil and water has been rinsed away the degreaser rapidly releases the oil again, allowing it to be separated. This leaves behind wastewater containing little or no toxic hydrocarbon content. 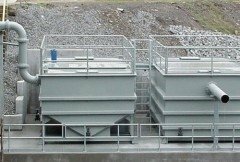 New degreasers are available that do not contain emulsifiers and toxic ingredients which can affect oil water separators and wastewater quality, particularly in wash bays for heavy vehicles, trains, and aircraft.